We spend more than 90% of our time indoors, which considerably lengthens our time of exposure to indoor air. For designers and engineers, this heightens the importance of ensuring that the indoor environment is designed to reduce contaminates, improve the quality of air, and increase the amount of outside air supplied directly within an occupant’s breathing zone. But the steps towards a healthy indoor air quality (IAQ) don’t stop with the design of a building – there are in fact, many actions employers and employees themselves can take to improve indoor air quality. Let’s first look at what the research tells us. There are a number of studies (for example here, and here) that show us the magnitude of IAQ on human health. From a combination of primary research studies, we’ve noted recurring outcomes that indicate a reduction of volatile organic chemicals (VOCs), lower CO2 differentials between indoor and outdoor air, and mechanical systems that double the code required minimum outside air rates, are all indicators of improved IAQ. These factors also tend to have positive effects on human health and performance. In 2004, Myatt et al studied three office buildings in Boston with varying indoor CO2 differentials — indoor minus outdoor CO2. The study found a 6.8% reduction in risk of exposure to airborne-transmitted rhinovirus, or colds, for workers in offices with an indoor CO2 differential of less than 100 parts per million (ppm) compared to those in offices with indoor CO2 differential higher than 100 ppm. The study even found that rhinoviruses can recirculate through systems with low outdoor air supply, increasing the risk of some airborne illnesses. An increased risk for upper respiratory tract infections can mean employees take sick days or come to work while sick – which wreaks havoc for both colleagues and productivity. In 2000, a study by Milton, Glencross, and Walters tracked 3,720 hourly employees across 40 buildings at Polaroid in work areas with varying rates of outdoor air ventilation. The study found a 35% reduction in short-term sick leave for employees in work areas with an outdoor air supply rate of 50 cubic feet per minute (CFM) per person, compared to employees in work areas with 25 CFM per person. Studies like this one from Allen et al have shown that “green” workspaces with higher outdoor ventilation rates can improve cognition and task performance by removing harmful compounds from the air. Participants in this study completed office-type tasks during exposure to varying concentrations of airborne volatile organic compounds (VOCs) and carbon dioxide. The study tested three environments: high concentration of VOCs, or conventional; low concentration of VOCs, or green; and low concentration of both VOCs and CO2, green+, which are typical characteristics of a system with a high outdoor air ventilation rate. The study found that the green environment improved cognition by 61%, and the green+ environment by 101%. In 2012, Satish et al asked participants to complete nine different performance tasks during exposure to varying levels of CO2. The highly predictive study found that a change in CO2 levels from 600 to 1000 ppm degraded raw scores for performance by 11 to 23% – despite 1000 ppm widely being considered acceptable. At 2500 ppm, most measures of performance decreased into the “dysfunctional” range – up to 94% lower — and in many ways mimicked the performance of an intoxicated person. In other words, as CO2 increased, all scores decreased. Designers, can take multiple steps to deliver a healthy IAQ, but ensuring the air in your workplace is healthy doesn’t have to be complicated. For starters, HR representatives can work with leadership to set goals early on when deciding where to lease. Create a list of criteria you want to use to compare all your options. 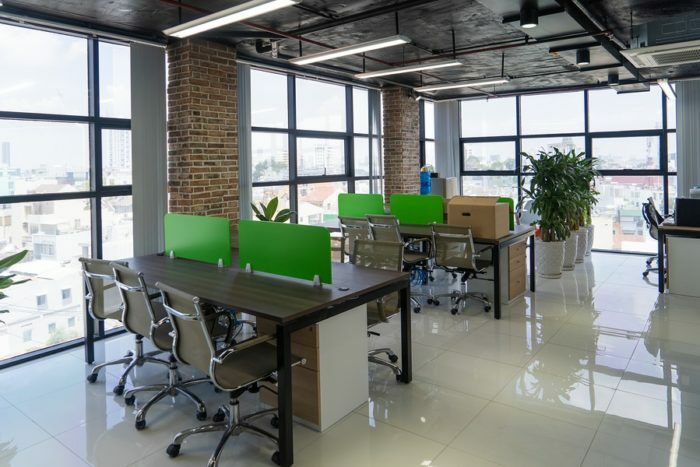 Consider factors such as mechanical systems, operable windows, and materials in the space, each of which play a role in your ability to make tenant improvements and impact your workplace’s IAQ. Off-gassing, which occurs when newly manufactured items release VOCs and other chemicals, can be a major contributor to poor IAQ. You can reduce off-gassing by utilizing low-emitting materials whenever possible, and by looking at your post-occupancy maintenance practices, including whether non-toxic cleaning agents are being utilized. Health product declarations (HPDs) are manufacturer documents that disclose product ingredients and any associated health hazards and can be utilized to find solutions that minimize toxic ingredients and off-gassing. Healthy materials target reduction in off-gassing and can improve indoor air quality inherently through reduced exposure to chemicals, so pay attention whenever new furniture is added, new painting is done, or other new materials are introduced into the space. Certain building product certifications and labels, such as Declare, Cradle to Cradle, and Greenscreen vetting, can aid in simplifying material selections. In instances when you’re remodeling or moving into a new space, it’s key to maintain an operational standard that includes ongoing work with your design team to ensure new furniture brought in post-occupancy will not off-gas. Whenever interior work is done, spaces should go through an air flush out to aggressively dispose of any off-gassing that has resulted from new construction or renovation. When it comes to maintenance practices, talk with your cleaning service provider about the types of materials being used, as these can play a significant role in air quality and should be monitored to reduce exposure to chemicals. Plus, consider source filtration, including air intake, building entrances, and exhaust for spaces that include off-gassing entities such as 3D printers or kitchenettes. If you can, ensure all entrances are designed to minimize entry of contaminates. One simple example of this is the use of entry mats, which can help with pollution control. Outside air intake locations for heating and cooling systems can be a key driver in limiting contaminates and unpleasant odors, so it’s helpful to position outdoor air intake away from sources of pollution and smells from traffic, restaurants, and other distinguishable sources. Provide filtration by installing a MERV 13 air filter for outside air intake. An even higher level of filtration, such as MERV 15 and/or carbon gas filters, are a good solution for locations where there are recurring issues with outside air quality from factories or fires. It’s also important to factor in the impact of fan energy consumption with use of filters. If you’re in the process of constructing or renovating a building space, certain mechanical design tactics can increase outside air supply and/or specify control sequences that keep CO2 ppm below optimum levels while minimizing energy consumption. These tactics and solutions should include energy performance as part of the decision-making equation. Mechanical design that keeps energy consumption and CO2 emissions low while maximizing air quality is key to improving air quality both indoors and outdoors. Some options include decoupling outside air ventilation from heating and cooling systems, such as chilled beam systems or radiant systems, and displacement or under-floor air systems that increase ventilation effectiveness by supplying air closer to the occupants’ breathing zone. As part of the post occupancy plan, ensure a schedule is in place for the continuous cleaning and maintenance of the air filters. But of course, you aren’t always in control of existing mechanical systems, so sometimes you must think smaller. Personal fans can be an effective way to provide some individual controls for users, not only from an IAQ standpoint, but also regarding thermal comfort. If there are operable windows in your building, these can be a great way to increase air flow (though it’s also important to use them responsibly and avoid increasing use of heating and cooling systems). In spaces that are solely dependent on operable windows for outside air, you’ll want to ensure all spaces have access to the air flow through either an open plan, or low or no partition design. Additionally, you can work with building maintenance to ensure filters and controls are maintained as needed based on building occupancy hours. Use select indoor plants to help filter and improve the quality and circulation of indoor air, and work with your facilities team to ensure a plant maintenance program is in place. NASA provides a list of plants that are most effective for indoor air quality enhancement; these include, among others, Boston fern, Chinese evergreen, English ivy, peace lily, and the spider plant. An added bonus of indoor plants is that they contribute to the biophilic impact on users, addressing humans’ innate need to connect with nature, and further enhancing the positive impact on the occupants in the space. Air quality testing sensors and occupant surveys can provide confirmation on whether the set air quality standards have been met. Sensors and testing can also be beneficial to track indoor air quality in existing facilities. Options for testing can include periodic spot checks and measurements, or tracking of ongoing measurements through air quality sensors, which can help capture the impact of changes in the indoor environment that may be increasing contaminants in the space. As an example, my employer DLR Group is currently conducting a firm-wide study that has turned our offices into labs to help our high-performance design teams evaluate and mediate any discrepancies detected in IAQ. Providing your employees with access to testing metrics can help them track their environment and provide them with the confirmation that higher standards are being met. You should also continuously work with building maintenance teams to modify controls as needed. Occupant surveys can also be a great resource for gauging comfort level and users’ perception of air quality, which in turn can allow you to see the impact IAQ has on productivity, both before and after you’ve made modifications to your practices. For more information on the workplace environment’s impact on employee wellness, check out DLR Group’s articles on views, daylighting, thermal comfort, and acoustics. Amarpreet Sethi leads DLR Group’s High Performance Design Team. She uses her knowledge of climate-responsive design, daylighting, HVAC systems, and energy efficient techniques as part of integrated design teams to deliver high-performing buildings for clients and users. She leads a team of designers and building performance analysts within the firm that strive to use science to design better buildings. Embedded in every DLR Group studio, high performance designers aim to deliver high performing buildings, net zero or near net zero buildings, deep green buildings, and carbon neutral regenerative design while shifting the minimum standard of design by providing metrics that highlight the value of high performance design.